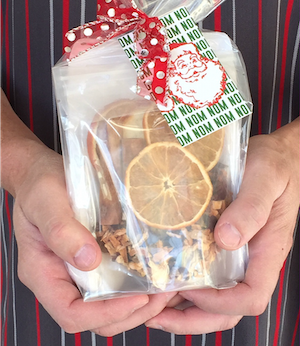 This holiday season is busier than ever for Dell Cove Spice Co. The Chicago-based producer of popcorn seasonings, barbecue rubs and cocktail-rim sugars is opening its first brick-and-mortar location. Owners Patricia and David Beets are planning to open the store just in time for Thanksgiving. "We wanted to try to be able to take advantage of the holiday season," Patricia says. "I'm kind of excited to decorate the window and make it all festive." To gear up for this busy time of year, the Beetses began preparing during the summer, when business was slower. They studied sales trends from the past three years and forecast what would sell well this year. "Keep track of what is working and what is not," Patricia advises. Below are a few more tips for handling the holiday rush, and we'd love to hear more. Share your best ideas by tweeting @smallbiznerds. Follow the Goldilocks rule when stocking up on seasonal inventory. Don't order too much -- aim for "just right" to meet customers' demands. The Beetses learned this lesson the hard way when they were starting the business in 2010. "We would be working these crazy long hours and completely blank out on who had bought what," Patricia says, reflecting on a time when she and David bought way more basil than they knew what to do with. Not willing to waste the perfectly good organic herbs, they used them to make flavored salt that they gave away as samples. But ultimately, the miscalculation lost them money. To avoid their mistake, look back on how much you've sold of various products in previous years and use that to estimate how much inventory you'll need this season. If you don't already, consider using an inventory management software or a point-of-sale system with inventory tracking capabilities to more easily monitor how much product you have and what you still need. If you, like many businesses, lack the cash to buy large quantities of inventory upfront, a line of credit or short-term inventory loan could be helpful. However, make sure you're confident that you'll earn enough during the holidays to pay off that debt and still turn a profit. For many businesses, it's all hands on deck during the holidays. But if you need more hands, consider hiring a temporary employee or two. In addition to helping you handle the holiday rush, temporary workers help could allow employees to take much-needed vacation days, keeping staff morale high, says Paul McDonald, senior executive director at Robert Half, a national staffing agency. Remember, though, that training someone new can be time-consuming. "The more specialized the contractor you're looking for, the longer it will take" to train them, McDonald says. He suggests assigning the temporary employees relatively easy tasks such as filing or social media management so you can free up your own time to tackle more demanding jobs. It's smart to cross-train your full- and part-time staff as much as possible, McDonald adds, making sure your employees know how to do each other's jobs. That way, you won't be scrambling when the only person who knows how to close out the cash register, for example, calls in sick. Stock up on boxes, bubble wrap and branded shipping labels, because almost half of holiday shopping will be done online this year, according to a survey by the National Retail Federation. But be realistic with yourself and honest with your customers about how many orders you can handle. If you promise shipments by Christmas and they're late, your customers will be more upset than if you had just politely told them you couldn't accept any more holiday orders. Finally, anticipate the questions you'll get from frantic customers -- "Where is my shipment? How quickly can I get it?" -- and respond in a calm, cheerful way, Patricia suggests. "Everyone during this time gets stressed out," she says. "If you're actually nice to people, they're so relieved and so happy that they'll be nice to you." Photo by: Patricia Beets / Dell Cove Spice Co.